This European design sofa is bound to transform your living space. Clean and simple lines make this leather sofa the ideal addition to any modern home. Beautify your living room with this gorgeous leather sofa. The 3 seater sofa offers you and your guests a huge amount of space and invites you to relax and enjoy. 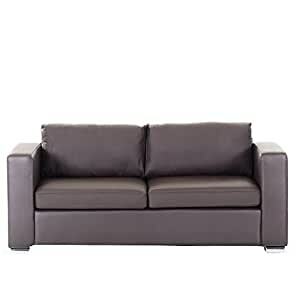 All seating surfaces and cushions are made of top grade 100% genuine cowhide leather, while sides, bottom and backside are made of high-quality synthetic leather (PVC).